1. Place the chicken carcass in a stockpot with salt and water to cover by 1 inch. Bring to a boil, reduce heat and simmer 30 minutes. Skim any scum that rises to the surface of the stock. 2. Stud each onion half with a clove and add them to the chicken stock, along with the remaining flavoring ingredients, and simmer, partly covered, 1-1/2 hours or more. Strain through a sieve into a bowl and discard the solids. Degrease the stock. 3. Bring the strained stock back to a boil in the stockpot and cook, uncovered, for 10 minutes to intensify the flavor. Taste carefully for seasoning. Reserve stock. 4. 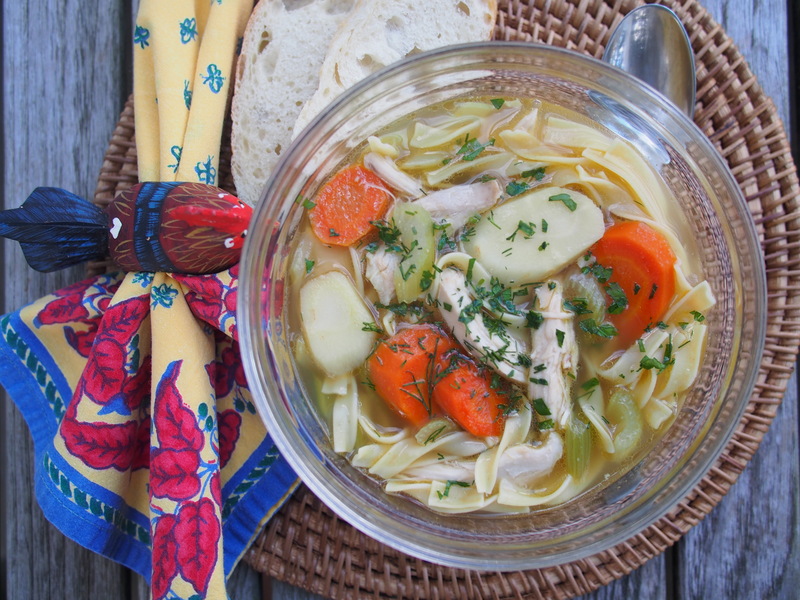 Add the shredded chicken, carrots, parsnips, and celery to the stock and simmer for a few minutes. Add the noodles and cook until they are al dente, about 5 minutes. Stir in the chopped dill and parsley. 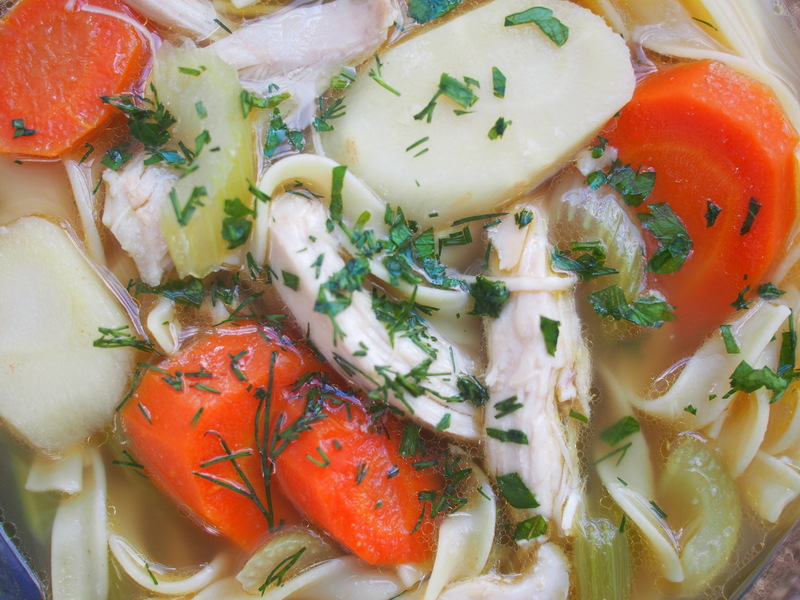 If your leftover chicken carcass doesn’t have enough meat on it to finish the soup: buy 2 pounds of boneless skinless chicken breasts from your grocery, salt them and add them to the stock after you’ve brought it back to a boil in step 3. Reduce the heat to medium and poach the chicken until the juices run clear, about 20 minutes. Remove the chicken with a slotted spoon to a plate to cool, then shred it. Proceed with step 4. This is a good use for left over roasted lemon chicken.